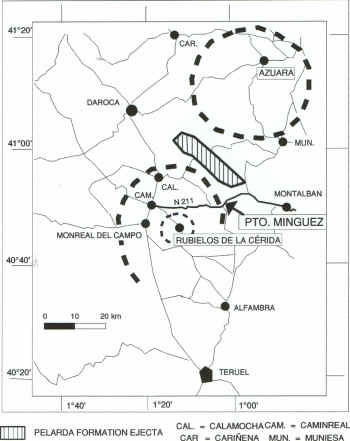 The Puerto Mínguez (see location map) has first been mentioned in a paper by Moissenet et al. (1972; see Ernstson & Claudín 1990) as the location of an “enigmatic” deposit of Paleozoic quartzite clasts. This small deposit was compared by Carls & Monninger (1974) with the Pelarda Fm., which in their opinion is a fluviatile boulder conglomerate. When Ernstson & Claudín (1990) suggested the Pelarda Fm. to be ejecta of the Azuara impact structure, they also pointed to the similarities of the Pelarda Fm. and Puerto Mínguez deposits. Meanwhile, the outcrop at the Puerto Mínguez has enormously been enlarged by new road construction of the N 211 national road between Caminreal and Montalbán, continuously exposing impact ejecta over more than five kilometers. These grand outcrops, which prove to be one of the most attractive impact ejecta deposits worldwide, are now considered to probably not expose ejecta from the Azuara structure because of their thickness with relation to distance. Instead, the Rubielos de la Cérida companion impact structure is suggested to be the source of the ejecta. In the following, photographs of the most significant macroscopic and mesoscopic features of the impact ejecta deposits are presented. Especially the mesoscopic deformations show remarkable similarities to deformations observed in the ejecta of the Ries crater and Chicxulub impact structures (see papers by Rampino et al. in the list of references, and below). There are geologists pretending that the deposits are typical Tertiary fluvial sediments and that the deformations are the result of tectonics. Other geologists (e.g., Casas et al. 2000; Geodinamica Acta, 1-17) regard the deposits as to have resulted from syn-tectonic sedimentation. It is obvious that these geologists have never visited the Puerto Mínguez and never studied these “syn-tectonic sediments”. The Puerto Mínguez at the rim of the Rubielos de la Cérida structure, companion to the Azuara impact structure.